Fresh Homemade Mozzarella Cheese Recipe - Make Mozzarella Balls! 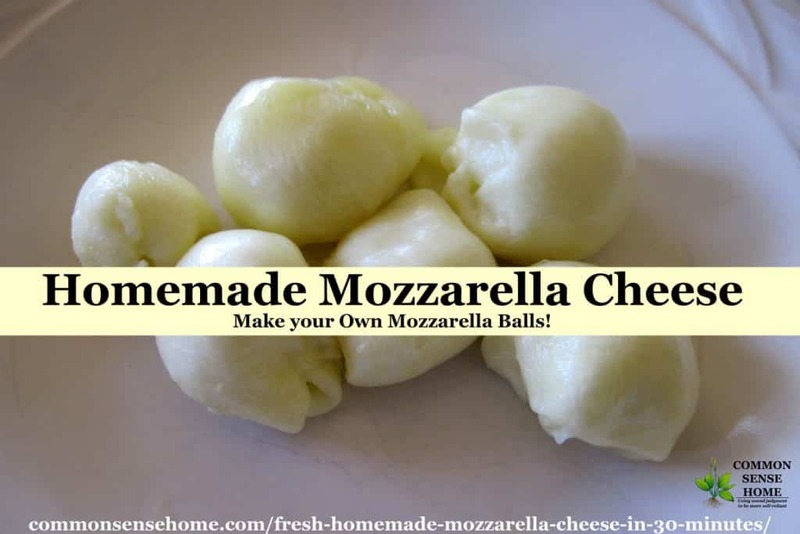 You are here: Home / Recipes / Fresh Homemade Mozzarella Cheese Recipe – Make Mozzarella Balls! 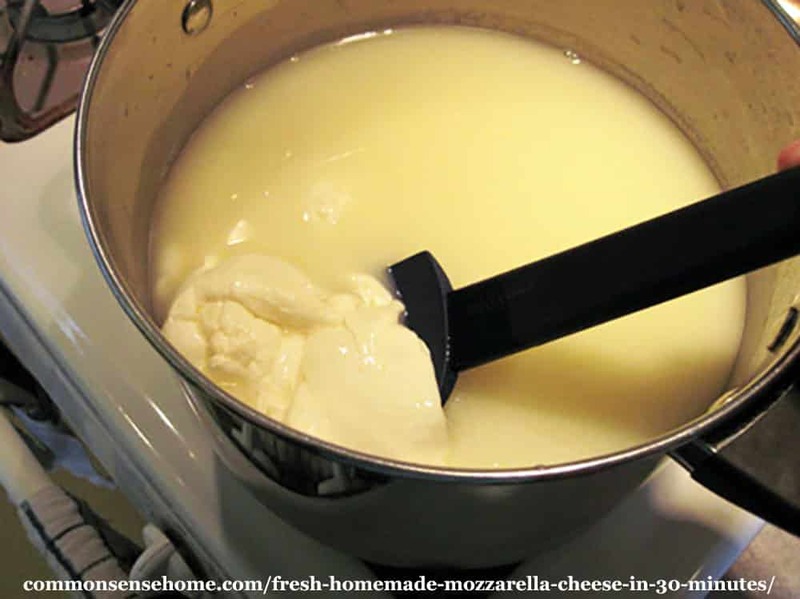 You can make fresh mozzarella cheese at home – with just four ingredients! 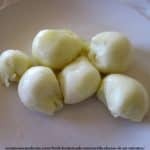 Use your homemade mozzarella to make mozzarella balls from scratch, or stretch it into homemade string cheese. 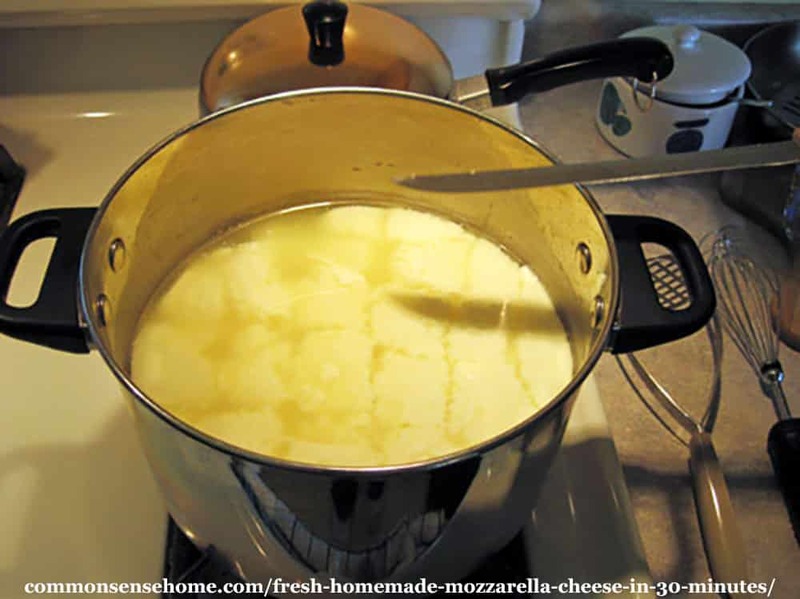 This posts features the “30 Minute Mozzarella Cheese” recipe from Ricki Carrol's book “Home Cheese Making“. If you'd like to make traditional mozzarella (which takes a bit longer), check out the “Cultured Dairy and Basic Cheese” e-course from Traditional Cooking School. This easy mozzarella cheese recipe works best with whole milk. Since I have a friend with a cow, we used whole raw milk. You may use skim milk, but the yield will be lower and the cheese will be drier. 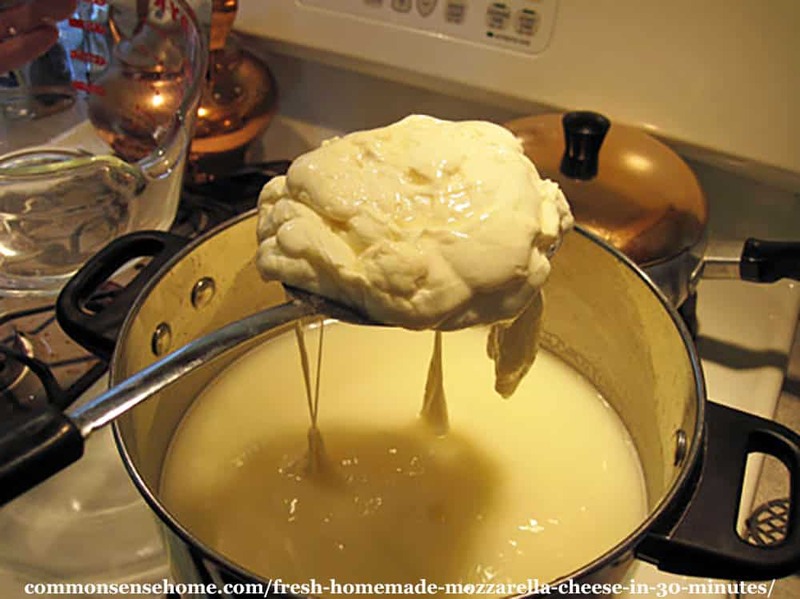 You cannot use UHT (Ultra High Temperature) pasteurized milk to make homemade mozzarella cheese (or most other cheeses). The extreme heat of UHT pasteurization damages the protein in the milk and it comes out looking like ricotta, no matter what recipe you use. Try switching brands of milk if your cheese fails, or find a friend with a cow or goat. Begin your cheese making process by prepping the ingredients listed above. Dissolve 1 1/2 teaspoons citric acid in 1/2 cup cool water. Place your milk in a large stock pot. Mix your rennet with 1/4 cup cool water. This homemade mozzarella cheese recipe is so easy the kids can make it. Gently bring the milk up to 55°F ( 13°C) in a large, stainless steel pot. While stirring, add the citric acid solution to the milk and mix thoroughly. Heat the milk to 90°F (32° C) over medium-low heat, stirring constantly. Remove the pot from the heat and gently stir in the diluted rennet with an up-and-down motion for 30 seconds. (We use a potato masher to move the milk up and down.) Cover the pot and leave undisturbed for five minutes. Check the curd. It should look like custard, with a clear separation between the curd and whey. (If the curd is too soft or the whey is too milky, let set for a few more minutes.) Cut the curd with a knife that reaches all the way to the bottom of your pot. Scoop out the curds with a slotted spoon and put into a 2 quart microwaveable bowl. Press the curds gently with your hands, pouring off as much whey as possible. After step 6, heat the reserved whey on the stove top to at least 175°F (80°C). Add 1/4 cup of cheese salt to the whey (you could probably substitute kosher salt, but cheese salt is best). Shape the curd into one or more mozzarella balls, put them in a ladle or strainer, and dip them into the hot whey for several seconds. Knead the curd with spoons or gloved hands between each dip and repeat this process several times until the curd is smooth and pliable. Please be careful! This is really hot, and working with more liquid increase the risk of getting splashed! Microwave the curds on high for 1 minute. Drain off all excess whey. 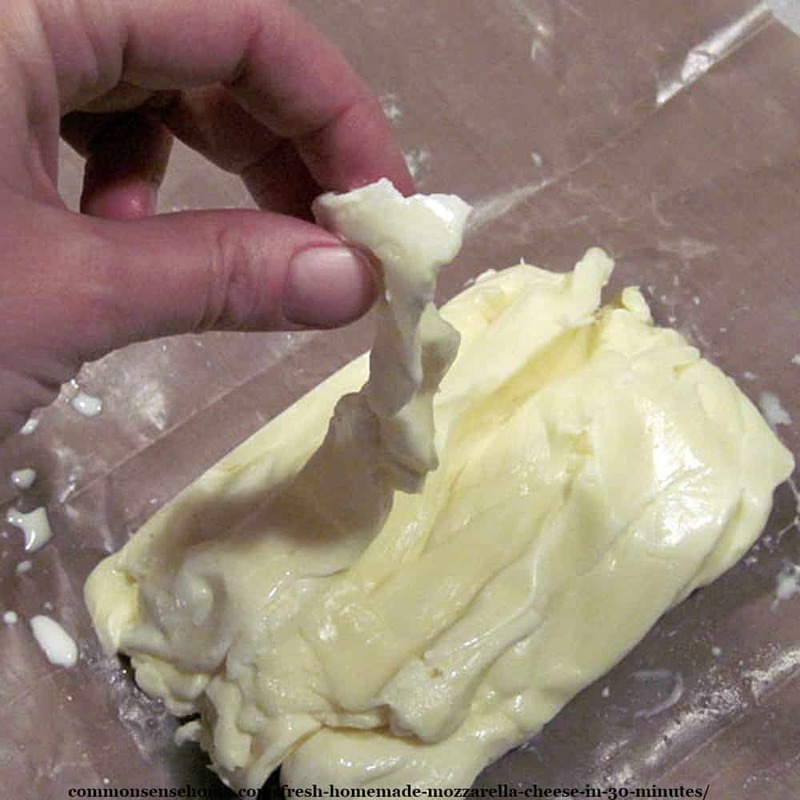 Gently fold the cheese over an over (as in kneading bread) with your hands or a spoon. This distributes the heat evenly throughout the cheese, which will not stretch until it is too hit to touch (145°F (63°C) inside the curd). Rubber kitchen gloves are very handy at this stage. Microwave two more times for 35 seconds each; add salt to taste after the second time. After each heating, knead again to distribute the heat. Knead quickly until it is smooth and elastic. When the cheese stretches like taffy, it’s done. (See top photo in post.) If the curds break instead of stretch, they are too cool and need to be reheated. When the cheese is smooth and shiny, roll it into small balls and eat while warm. Or place them in a bowl of ice water for half an hour to bring the inside temperature down rapidly; this will produce a consistent smooth texture throughout the cheese. Although best eaten fresh, it can be stored in the refrigerator at this point. With some experimentation, I found you can pull this mozzarella cheese into strips or strings – think “homemade string cheese”. Pull the strips, drop them in the water to cool, then pack them tightly in a Pyrex container or wrap in plastic wrap. They're not as pretty as the store bought ones, but they work just the same. Although the original recipe recommended storing the cheese in water, I prefer storing it in a tightly sealed container without water. Water storage makes the cheese soft and washes out the salt. If you want to add lipase powder to give the cheese more flavor, use 1/8 – 1/4 teaspoon, dissolved in 1/4 cup cool water and allowed to sit for 20 minutes. To start, probably try the mild and see how you like the flavor. Add the lipase and water mixture at the same time you add the citric acid solution. If you add lipase to this cheese, you may have to use a bit more rennet, as lipase makes the cheese softer. You can make your own mozzarella balls to use in recipes or enjoy warm and melty-soft. Just follow the recipe above, and when it's time to shape your cheese, pinch and roll it into small balls. This works best when the cheese is still very warm and stretchy. If you have a friend to help with shaping, you could stretch the cheese into a long rope and let them snip off small sections with kitchen shears or sharp (clean) scissors to speed up the process. This is a great activity for older kids with supervision (the high heat makes it a little risky for the younger set). They can shape their own mozzarella cheese balls or string cheese and gobble it right up. You may also enjoy our other recipes, such as, Cheese Soup in Homemade Bread Bowls. 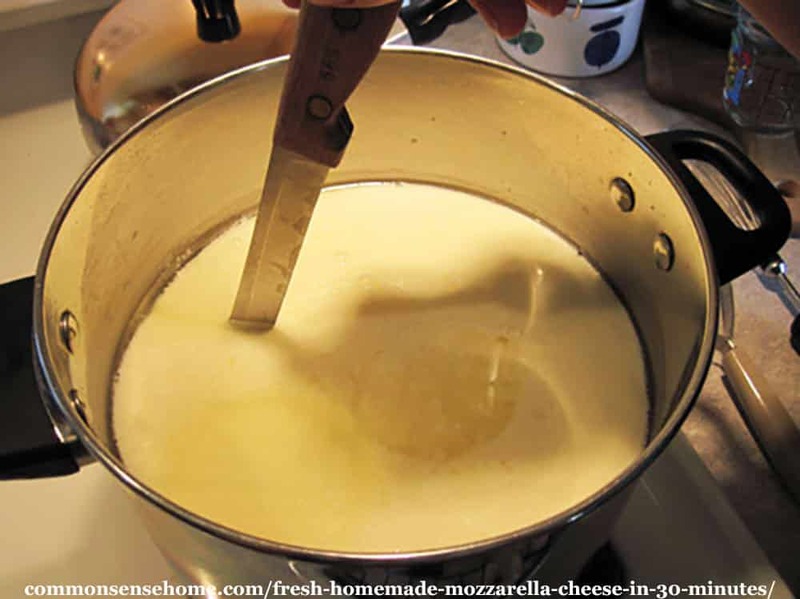 Quick and easy homemade mozzarella cheese recipe, ready in about 30 minutes, that you can use to make homemade mozzarella cheese balls or string cheese. After step 6, heat the reserved whey on the stove top to at least 175°F (80°C). Add 1/4 cup of cheese salt to the whey (you could probably substitute kosher salt, but cheese salt is best). Shape the curd into one or more balls, put them in a ladle or strainer, and dip them into the hot whey for several seconds. Knead the curd with spoons or gloved hands between each dip and repeat this process several times until the curd is smooth and pliable. Please be careful! This is really hot, and working with more liquid increase the risk of getting splashed! Can I make fresh mozzarella cheese without rennet? If you have fresh stinging nettles available, you can make a homemade vegetable rennet that should work for mozzarella cheese. Cultures for Health provides full instructions for rennet nettle on their website, including substituting dried nettle for fresh. You'll want to gather the nettle before it goes to seed, which will make it unfit for cheese making. To make nettle rennet, combine 2 pounds fresh, clean nettle leaves with 4 cups water in a large pot. Bring to boil, reduce heat, cover and simmer for 30 minutes. Add one heaping teaspoon of salt and stir to dissolve. Drain nettle mixture in a cloth lined colander until quite dry. Use 1 cup of nettle rennet per gallon of milk. Store in a sealed, refrigerated container for up to two weeks. See “How to Make Nettle Rennet for Cheesemaking” for more detailed instructions. What's the Best Rennet for Mozzarella Cheese? Either animal or vegetable rennet will work just fine for making fresh mozzarella cheese. For cheeses that are aged longer, it's best to use animal rennet, as vegetable rennet may become bitter during the aging process. I find liquid rennet a little easier to use than rennet tablets. Note: If you use the non-microwave method, you cannot use the whey to make the ricotta recipe below, because the whey will contain too much salt. I later read that the 30 minute mozzarella whey is not recommended for making ricotta (it says this in the cheese making kits), but mine works just fine. Heat the whey in a pot until foam appears, This usually happens just prior to boiling; if the mixture boils, it will taste burned. Turn off the heat; let the whey set for 5 minutes. Gently skim off the foam and place the whey in a colander lined with butter muslin. Let drain for 15 minutes, then refrigerate. This ricotta will keep for up to one week in the refrigerator. The ricotta from our raw milk mozzarella was lovely. Very smooth and creamy, and just a tiny bit sweet. It works great in homemade lasagna. If you don't want to make ricotta from you whey, you can add the leftover whey to smoothies, drink it yourself, or share it with livestock. Another family favorite that may be even easier, although it takes a bit longer, is fromage blanc. Fromage blanc is a soft white cheese that is great as a spread or dip. (Or for topping spuds – yum!) It can also be used in cooking. The recipe only has five steps – that's it! Learn how to make fromage blanc in this post. We also have instructions for making large curd cottage cheese. Note: For our readers coming from overseas: If English is not your native language, just use the translate box at the top of the site to convert this mozzarella recipe to Hindi, Urdu or other languages. Looks Great… Cant wait to try it one of these days. Very tasty! It was great to make something that I've always had to buy in the past. Is there a way to do this without a microwave? Yes – it's covered in detail on Ricki's site. The link is in step 4. This looks a lot easier than I thought. I can’t wait to try this! Laura – if you tackle this one successfully, traditional mozzarella is featured in the Traditional Cooking School e-course “Cultured Dairy and Basic Cheese“. I’m not sure, as it’s never lasted more than a few days. I’d say the quality is best eaten fresh, and I’d use it up in less than a week. FYI, if you make mozzarella and get the ricotta curd instead….make lasagna 🙂 It’s a great sub in for actual ricotta and if you used lipase in the recipe it tastes a bit like the two together like you would do anyhow for making lasagna. We’ve lovingly referred to that mistake as mozzaricotta in our house. Melody – that’s a good idea. 🙂 i might be tempted to make it into “cheese pancakes” (like potato pancakes, but made with cheese). Can’t let food go to waste! Where do you get rennet? Thanks! Greer – I buy rennet either at our local homebrew store, or online through Cultures for Health. The link to CFH is at the bottom of the post, or on the sidebar of the blog. They are really nice and very helpful, and have lots of free information on their site. Hi, Can you use the rennet for custard and ice cream or is there some that is only for cheese? I’ve never used an ice cream or custard recipe that has rennet in it, but I don’t see why it wouldn’t work. To really get mozarella with excellent taste, use lipase powder. About a quarter teaspoon per gallon of milk. Makes a world of difference. If you want to add lipase powder, use 1/8 – 1/4 teaspoon, dissolved in 1/4 cup cool water and allowed to sit for 20 minutes. To start, probably try the mild and see how you like the flavor. Add the lipase and water mixture at the same time you add the citric acid solution. If you add lipase to this cheese, you may have to use a bit more rennet, as lipase makes the cheese softer. Can you use whey from yogurt to make ricotta cheese? Have been looking around on your website-very interesting. I don’t think it would work, and I’ve never heard of anyone doing it, but you could always heat up your whey and see what happens. That way you’ll know for sure. You must be kidding… I’ve watched my mom and also made cheese and NEVER added any acids or any kind of chemicals. Research people forget the fast easy way and go do it the right way! LightFeather – there are many ways to get a job done. If you blog, or have a site you would recommend for traditional mozzarella making (which this recipe does not claim to be), please feel free to link up a post to show how you make cheese. As far as I know, there is no way to make traditional (naturally acidified) mozzarella in 30 minutes, but I may be mistaken. In order to be accurate this is a cheese like mozzarella! Real mozzarella is made from water buffalo milk in Italy and has several certifications to prove its origin (STG & DOP). The taste is really different from this cheese, much whiter too. As a french, cheese and their certifications are really important, they are what protects our culture and our farms financially sustainable. I understand that buying mozzarella di buffala in the US might not be very convenient nor reasonable but please help us protect our local food system by not naming your products mozzarella or parmesan when it’s not. Caroline – I understand your train of thought, but the cheese is not my product, it’s the cheese lady’s product, I’m just sharing her recipe. The Merriam-Webster online dictionary defines mozzarella as “a moist white unsalted unripened cheese of mild flavor and a smooth rubbery texture”. This cheese is no way intended to be a traditional mozzarella – the flavor and texture of those is superior – it’s intended as a quick and easy introduction to cheesemaking. Thanks so much for these instructions! I bought a cheese making kit a few years back and was all excited to try it, but only did it once because the recipe made absolutely no sense (and *insisted* we had to use non-homogonized, whole milk). We’re going to give it another shot with plain old milk and see what happens! Non-homogenized whole milk will give a better quality product, but regular store milk should work, as long as it’s not ultra-pasteurized. The super high temps damage the protein in the milk so much it won’t make cheese anymore. Still not sure what my problem with mozzarella is though. This time maybe I stirred it too much but….Thank you for your post and I will keep trying. Rikki has a mozzarella FAQ page that may give you some ideas. My first thoughts are milk change or over-stirring. This IS PERFECT for pizza. I have a recipe for 100% while wheat that I love. A treat for the weekend! Thanks! How much cheese did you get from one gallon……looks reeeeeeeeeally good. You will get roughly 1 pound per gallon for hard cheeses and 2 pounds per gallon for soft cheeses. Yield depends on the butterfat content. More fat = more cheese. 🙂 This is why certain breeds are preferred for cheesemaking. I go to Amish country a couple times a year to buy farm fresh foods, bulk food items and such. I’ve toured cheese manufacturing sites and watched large vats of cheese being processed. It all looked pretty intimidating to me. 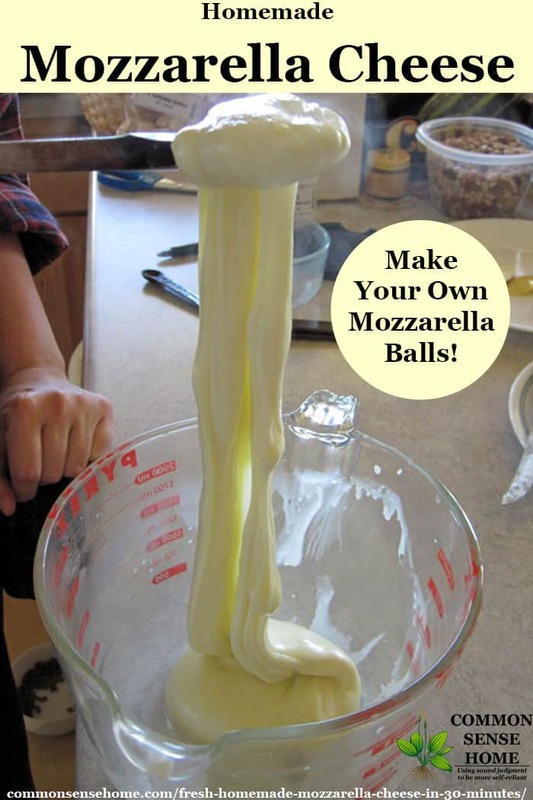 I’m glad I happened upon your instructions for making Mozzarella Cheese. I feel a bit more confident now. I too will pass this along….thanks. Making “real” mozzarella requires a bit more patience, but this is an easy way to get started with cheesemaking – and it’s fun! As far as I can guess, it may be that the milk in not UHT, but has still been heated up enough to damage the proteins. 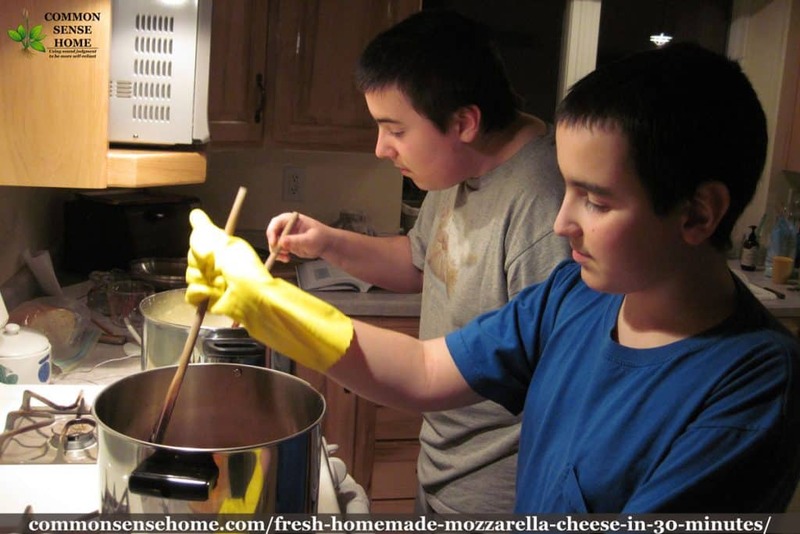 I highly recommend visiting Ricki’s website, specifically the mozzarella FAQ page, and checking out the images to see if you can find something that looks similar to what you have: http://www.cheesemaking.com/store/pg/242-FAQ-Mozzarella.html I’m a cheesemaking “newb” as my boys would say, and I bow to her much greater experience on this. Sorry it didn’t work out. 🙁 Ours has gone off without a hitch each time, so I never realized how many difficulties people would run into. Just had the exact same thing happen! I’m using whole raw cows milk. I followed the directions exactly as well. I have no idea what to do with this giant pot full of liquid gold. Is your thermometer properly calibrated? I’ve been trying to think of anything else that would cause problems, and I know my cheesemaking has been more difficult since my old thermometer died. The new one doesn’t seem to give reliable readings. I used cows milk and 1/3 cup of white viniger per 3/4 gal. Of milk, yield for 3 gallons was about 3 1/2 lbs of white cheese. This looks fun to make. I think I’m going to try it with my boys. I will NEVER purchase mozzarella from the grocery store again! Oh, my goodness, this is delicious! I didn’t have any luck with ricotta though, after carefully following the directions for Ricotta from Heaven. Any idea why not? I used whole milk for my mozzarella, and proceeded directly from the making of the mozz into the directions for the ricotta. I do plan to try again next time, but any suggestions would be appreciated! Thanks for a delicious recipe! I don’t know for sure. Ricky says the ricotta doesn’t normally work with the 30 minutes mozzarella, but it always has for me. I start with raw milk from Guernseys. I don’t know if that makes a difference or not. So glad that it worked out well for you! With the trend towards ultrapasturized milk, cheese makers are having a tougher time finding milk that will make cheese. Thanks for your kind words and sharing your success. from step 2 to step 3, it didn’t ever turn into any thickness than just the milk itself, no curds, no whey, just milk. Kind of disappointed, I followed it exactly! My guess would be either your rennet was bad or not mixed properly, or the milk used was UHT (Ultra High Temperature) Pasteurized. Most store milk is now UHT and will not make cheese because the milk protein is damaged by the high heat. What did I do wrong? I followed the instructions but after heating about 6 times it never stretched and when I kneeded it, it was dry. never got shiney. I grated it onto some corn chips and after 1 minute in the microwave it never melted! It seemed to make the curd in the beginning fine. It was all down hill from there. It sounds like you may have overheated the curds, turning them rubbery, but it’s really hard to say for sure without being there. I’ve noticed that since I replaced my old digital thermometer (it died), the new thermometers have been less accurate and more prone to jump up and down in temperature. This recipe was fantastic! We substituted white vinegar in place of the citric acid and it worked great. The Ricotta was awesome as well. Yeah! So glad that it worked out well. I’m excited to learn about replace citric acid by vinegar. Is there any chance to replace rennet ? Because there are people that only use vinegar to obtain curd and make cheese. Is there any chance to get “mozzarella” in this way with all the manual + heat work ? Joseph, did you use the same amount of white vinegar as citric acid called for? I have made the cheese 3 times. It comes out a bit grainy. Any hints? My microwave doesn’t get as hot so I microwaved it a little longer. I’ve never run into grainy results. Maybe try the boiling liquid method and see if it works out better? Thank you. I used a different brand milk and cooked it to a higher temp. Worked much better. Glad that you found a solution that worked. I want to try the recipe, but do not know what the ingredient rennet is, how it look, or where it can be found. Please advise. I am from Free State in South Africa. Traditional animal rennet is an enzyme derived from the stomachs of calves, lambs or goats before they consume anything but milk. (Ours is all from calves.) It is about 90% pure chymosin. Vegetable rennet is obtained from a type of mold (Mucur Miehei). However, even though it is derived from mold, there is no mold contained in the final product. It is an equivalent chymosin product which works equally well but is not animal derived. You can purchase it online via amazon.com through the links in the post, if Amazon.com delivers to your area. Otherwise, if you have any shops or stores that sell cheese making supplies, they will know what rennet is. Some plants have also been used to make a rennet substitute, but I have not tried them in this recipe. This post on stinging nettle (Urtica dioica) contains instructions on how to make nettle rennet substitute. Hi, I’ve heard that you can use lemon juice to split the milk is this a viable method instead of using rennet or would you still need to use rennet? That will work for some soft cheeses, but I don’t recommend it for this recipe.